Owen Simoes founded an antique furniture flipping business called SquidFlip in Concord, N.H., in spring 2017. 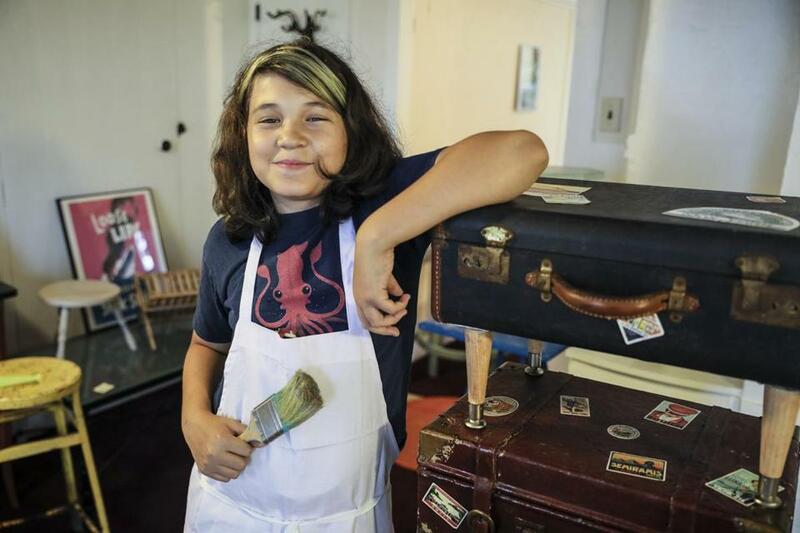 CONCORD, N.H. — Twelve-year-old Owen Simoes loves to work with bright colors while refinishing antique furniture. But he hates using spray paint, which stains his hands and the grass in his parents’ backyard. So he developed SquidInk, his version of a washable “chalk” paint popular with furniture flippers and artists. Owen is a “kidtrepreneur,” and he’s not the only one. Last month, Entrepreneur magazine ran a cover story on Michigan’s 13-year-old Alina Morse, founder of the healthy candy maker Zollipops whose sales this year are projected at $5 million to $6 million. Brothers Anthony Anderson and Ja’Den St. Hilaire from Atlanta started Brown Boys Lemonade to earn money for video games. The duo now travel to flea markets and festivals to sell lemonade by the gallon, and they have more than 26,200 followers on Instagram. Owen Simoes used one of his own chalked paints to paint a bookstand at SquidFlip in Concord, N.H.
Pint-size business people around the country are designing websites and managing social media accounts. In his research into youth entrepreneurship, he found that kids who pursue business ideas at a young age perceive risk and failure in a different way than their peers. Rather than throw a tantrum when things don’t work out, these kids see opportunity in defeat. “When you’re trying to sell something and people are rejecting what you’re offering, that can be depressing and disappointing. His ability to manage his feelings around that takes a lot of maturity and sense of self,” said Owen’s mom, Laura Simoes. Owen runs his business from two rooms below his father’s office on Warren Street in Concord. 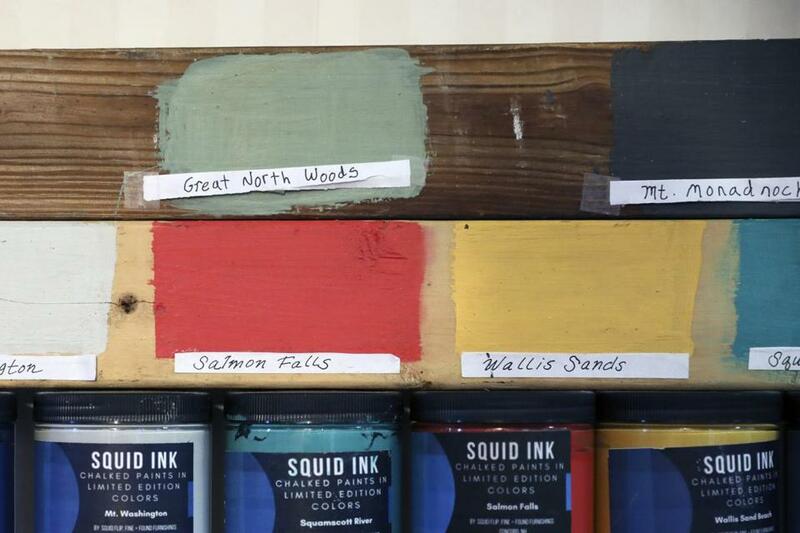 The shop carries seven shades of SquidInk paint that he makes with ingredients from a hardware store and uses to redo antique furniture. He calls it “chalked paint,” to distinguish his cheaper alternative from the more widely known “chalk paint” copyrighted by artist Annie Sloan. Since SquidFlip opened in the spring of 2017, Owen has spent as much time as he can expanding the business from behind the counter and his computer screen. He juggles flipping furniture, working in the shop, and running the online store with school, electric guitar lessons, snowboarding practice, and some downtime for video games. 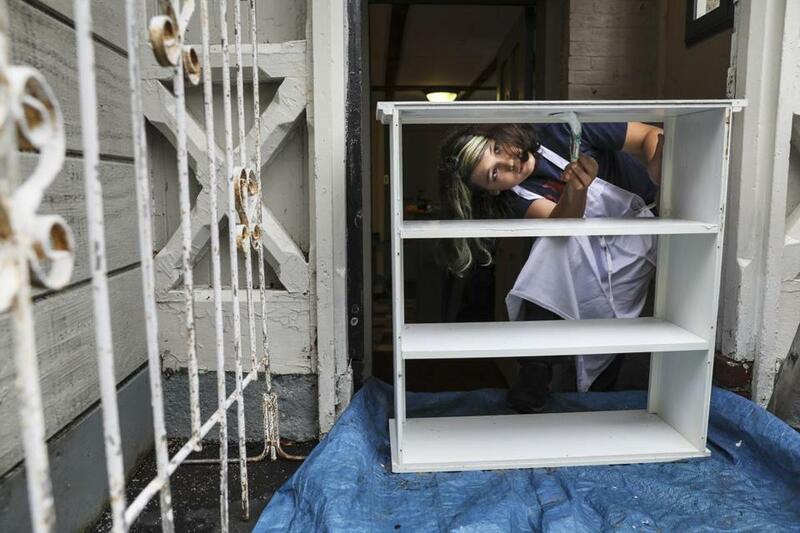 He sells refurbished furniture ranging from repainted stone-top dressers to chicken coop coffee tables, as well as branded mugs and smaller antique items. One piece features a rectangular metal tray filled with white powdered rocks and fake succulents. It’s covered with a sheet of glass and placed atop a beige crate to create a table. Owen said he was inspired by the HGTV show “Flea Market Flip,” on which contestants redo items and compete to see who can make the most profit. He first started flipping furniture when he and his mom furnished their vacation home in Maine with items from antique markets and garage sales. “It’s wonderful when kids want to recycle and understand that there is value in things with age,” said Dustan Larsen, co-owner of the antique shop Hatch on Maine in Brunswick, Maine, of blue-haired Owen. After Jennifer Frizzell purchased a table made from an antique suitcase for a room in her home filled with travel souvenirs, Owen customized it with vintage passport-stamp stickers from the countries she had visited. Through his website, Owen has sold pieces to customers in Texas, Arizona, and Tennessee.